Combining found elements with those fashioned by my own hand, my work encompasses two- and three-dimensional collage as well as sculptural objects. Infused with a rich sense of history, the essence of my work lies in the age-old struggle between nature and the man-made industrial world. My challenge is to convey that sense of conflict in a way that resonates with the viewer. I incorporate Victorian era botanical imagery, ancient anatomical diagrams, and vintage mechanical components along with natural materials. Whether it’s a rusty piece of metal, branches from an oak tree, or tiny turquoise-tipped rooster feathers, the right juxtaposition reveals itself to me—the more absurd, the better. A character is born and a narrative begins to unravel. The theme of flight is recurrent, as is the conflation of anatomy and mechanics. The result is a menagerie of ethereal winged creatures, human and animal hybrids, and fanciful flying machines. In this era of mass-production and instant gratification, it’s my hope that these intimate and meticulously crafted works will also evoke a sense of rarity, delight, and mystery. St. Andrew's School, Middletown, DE. The New York Art Directors Club, New York, NY. Denise Bibro Fine Arts, New York, NY. HOW Design Conference, Boston, Mass. Blue Door Gallery, Yonkers, NY. The NY Times, NY; City Arts Magazine, NY; Gallery and Studio News, New Canaan CT; CityArts, NY; Print Magazine, NY; Eyes In Magazine, Novum, Germany; Idea, Japan; Graphis, Switzerland; Chatham Currier, Chatham NY; Kolaj Magazine, Quebec; and International Assemblage, Australia. Prototype #6 (2015), mixed media collage, 9.5 x 12.5 in. ALB09 (2009), mixed media construction, 29 x 9.5 x 15 in. Successful art beckons the viewer to pause, to step out of sync with the daily march, even if just for a moment, and consider a meaning on a different plane of thought. Visual artist and collage extraordinaire, David Barnett, achieves this success time and again with his mechanical constructions and collage creations, made of uncycled materials and discarded pieces of machinery. The Fables: Beatrice and her Notebook (2011), collage, 12 x 11 in. In between the seamless digital construction and the built-up painted surfaces were the eccentric, exquisitely crafted collages of David Barnett, whose work is populated with believable, if otherworldly, figures. Relying on visual balance rather than clever juxtapositions (we enjoyed a lively discussion about distraction in collage). Barnett's detailed worlds are ripe with reference while deliberately downplaying the shadow lines and layerings usually associated with collage. Workmen's Circle (2011), mixed media construction, 21 x 8 x 18 in. The weeks between mid-December and early January are a slow news time in the galleries. That makes it a very good time to introduce artists whom galleries are interested in taking aboard or ones they simply like but cannot accommodate on the roaster. Denise Bibro's Winter Salon is a lively sampler of 21 artists, six of them invited guests. Recognition comes slowly to artists like David Barnett, sui generis and not readily pigeonholed in a particular movement or line of descent. His fey, delicately crafted are about the most satisfying works on the contemporary scene. Fragments of found materials are conjured into collages and intricate three-dimensional machines that combine Victorian-era botany, vintage anatomy plates and medieval saints into darkly imagined hybrids. Fragile nightmares, really. Barnett’s Company of Three Players, is a stage set with figures made of calibers, springs and a medley of figures, both the likeable and the unlovely. It is a good introduction to his pictorial wit. Viewing the deliciously obsessive art of David Barnett, one is drawn into his world of twisted Victoriana and mechanical madness. The exhibition at Denise Bibro Gallery is a combination of collage, found objects and extraordinary mechanisms fabricated by the artist. It is a complex show, and not everything works, but the pieces that do are knockouts. 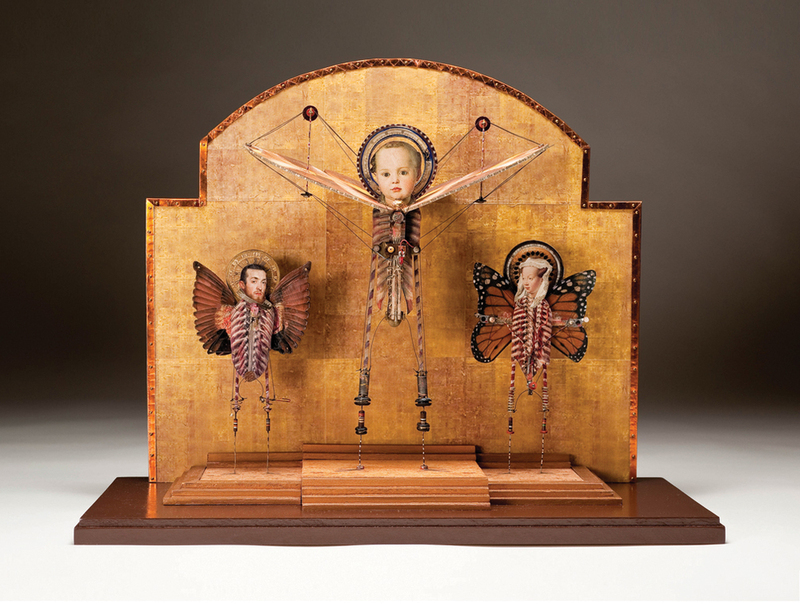 Barnett has titled his exhibition Sacred Creatures after pieces early in the series that combine religious iconography with the imagery of flying insects. 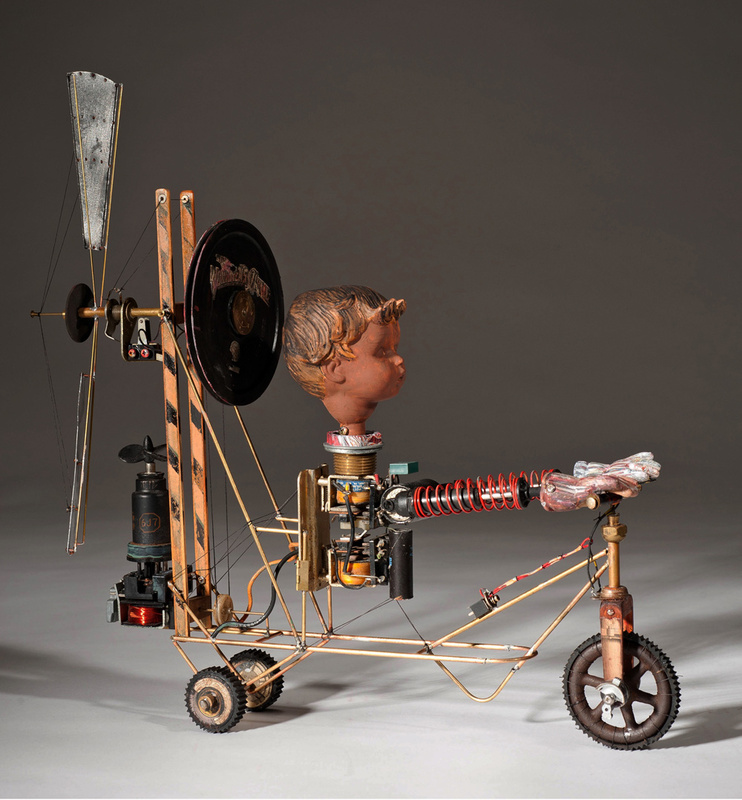 The exhibition quickly veers into other territory exploring family, history, flying machines and mechanical toys. Exquisitely crafted, the sculptures are a delight. Tiny gears and minutely crafted mechanical apparatus turn the piece ALB 09 into a marvel of engineering and design. An elongated mechanical flying machine, a sort of primitive helicopter, is constructed of delicate struts made of copper and brass. The front, like the prow of a ship, is a huge Victorian baby head collaged in old newsprint. All of the sculptures are robust in design and execution. Tin Man, Sir Oswald and Family Tree are simply marvelous. 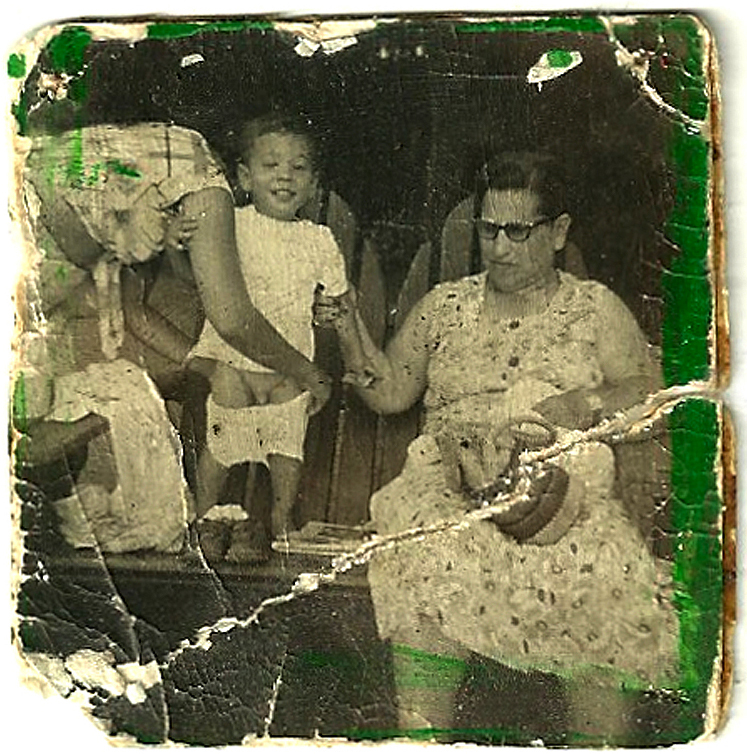 Some of the pieces actually work via small motors that drive the Ferris wheel of Family Tree around an awkward motion. Others imply the notion of work but are in fact static.